N-Strike foam dart system goes to the next level with the Raider Rapid Fire CS-35 blaster, an air blaster system with a transparent drum magazine containing exclusive red darts. With the highest Nerf dart capacity yet, the drum magazine hold 35 darts and features a clear window to let you know when your projectiles are getting low. 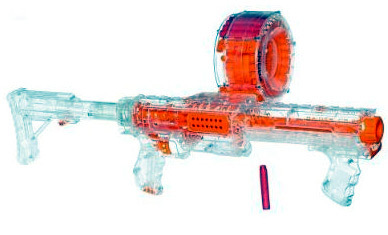 Toy blaster comes with clear container, 35 clip system form darts, tactical line, and holding shoulder stock.